This drug is not a steroid. It is a chemical that was originally used as a dispersing agent. When administered to an injection site, Thiomucase got the drug into the system faster. This speeds up the effectiveness of the drug. Bodybuilders have been using the drug for spot reduction of problem fatty areas. It is available in a liquid form which is injected in small amounts right into the problem area with a small needle. Also, a cream is made that can be applied to the skin over the area. Some mix the liquid with DMSO and apply it to the fatty area and report better results. 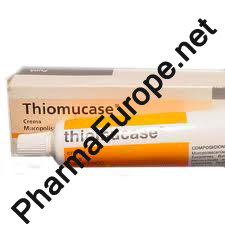 Oral tablets are another form that Thiomucase is available in. These are taken several times a day for about two weeks before a contest. Most feel that the orals are not effective. Finally there is a suppository form of this medication. They are inserted two times daily for about a week before a contest. Often all of these methods are used at the same time. Most bodybuilders who used these items reported some degree of effectiveness. Occasionally, the drugs worked remarkably well. Thiomucase has been found to work best in those who are holding extra water in fat cells due to estrogen. The drug allows as much as 20% more water to be freed from the fat cell. This can make the fatty area look much less dense. Several years ago this drug could be obtained very easily on the market, nowadays it is very hard to find. Package: Usualy in liquid form or cream. Usage: Described in the upper text.